Bold styles to redefine modern. From Traditional to Contemporary, something for every style. 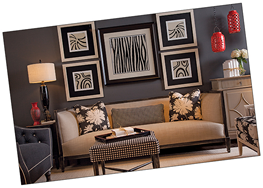 Z Art Group is an industry leader in sourcing and creating unique art pieces. Our attention to detail, excellent customer service and commitment to quality serve as the basis for an inspirational offering of wall decor. Z Art Group has recently moved into a larger location, to better serve our customers! Please note our new address, and take a look at the latest release by clicking the button below!